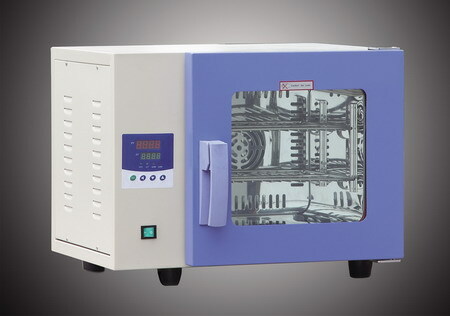 GRX Series Hot Air Sterilizer Oven performs treatment by high termperture and have the functions on microbial oxidation, alterative protein and dielectric concentration that cause to poison. The treatment by high termperture and hot have the functions on microbial oxidation,alterative protein and dielectric concentration that cause to poison.it destroy the cell protoplasm and caurse the microorganism to die,so this methods can kill the whole microorganisms in regular heating time. 1.Precision: high precision digital thermometerl,very exact,dependable. 2.Quick:Heat quick,forced convection,dry and heat air directly suffer the object, disinfect time to shorten obviously. 3.install:Control the intelligence system, over hot protection, exceed the limited temperature to break off automatically , alarm annunciator,blend the hot circulation,heat,breeze can operate autocephaly.insure personal/machine's security.